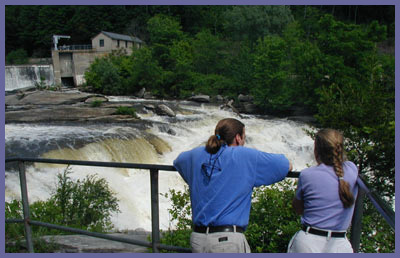 Falls Village - Iron Works Historic Site and A.T.
Main attractions: Historic iron works site, waterfall, Appalachian Trail, river walk, open fields, wheel-chair friendly path. Falls Village with its historic iron works site, waterfalls, Appalachian Trail access, and one of the few wheel-chair friendly trails, offers a wide range of experiences nestled in one of the most picturesque towns in Connecticut. One hundred and fifty years ago, Falls Village was known as Amesville and it was a bustling iron works region. This part of Connecticut produced an incredible amount of iron for quite a long time. During both the Revolutionary and Civil Wars, Amesville was a major source for materials used in producing much of the armaments used by our nation's military. At its peak three shifts of 800 men worked around the clock producing iron. The Housatonic River powered the production system and the railroad provided transportation and delivery. When the iron ran out, the whole thing went bust. Over time, nature and the agricultural industry turned Falls Village region into a quaint New England town. However, this site provides plenty of reminders of what once was and it's definitely worth the trip to learn more about it. If you're just into the hiking, then you couldn't ask for a better jumping off point. Falls Village is a favorite stop for those making the long trek over the Appalachian Trail. The river views, open fields, rolling hills, and colonial setting make for some of the nicest scenery along the A.T. The white hash marks of the A.T. abound here and you can easily find a good jumping off point for serious hiking, day hikes, or small jaunts into the woods without having to journey too far from your car. If you're the type that just likes to pull your car up to an interesting place and investigate, there's plenty here. The obvious spot is the dam and waterfall at the old iron works historical site. After a good rain or snow melt, the water rages through the man made ravine putting on a powerful performance. There are a few overlooks along the trail (or road if you want to drive around) that offer fantastic views of the falls and old power station. Warning: Use extreme caution as you approach these overviews as well as the top area parking lot where you can pull right up to the riverbank. The water rushing through here is powerful even when it's small. Little children are likely to run up ahead to get a look for themselves. Don't let them go up without you. There's potential for disaster if you take this area for granted. Large slippery rocks, steep drop offs, and the temptation to wade into the river amongst smooth rock surfaces can spell disaster. It may not be Niagara Falls but the power of the river here is deceiving. Enjoy awesome views but please be careful. And don't forget to walk the short footpath at the top of the falls (walk to your left along the river from the parking lot here). There's an educational path with markers and info along the way the explains the fascinating history of old Amesville. Maybe the best part of this area is the wheel-chair friendly trail back at the main area, just to the left of the hydro-electric power station as you enter this area. It's a great idea and those responsible for building it should be commended. There's not enough of this sort of thing. Two trail loops, 3,215 feet or 5,058 feet (or about a 1/2 mile to 1 mile) meet up with the A.T. The pathway is compacted gravel with tree roots and other obstructions taken out. It's firm and wide, providing ample support and accommodations if your group as many hikers who need wheelchair access. This trail offers great river views, open fields, serene woodlands, and other natural highlights. Mixed in with this is the interesting power station built on the old Falls Village Fairgrounds. Another attraction is the world class rapids that can be produced by the power station providing kayakers with a dream playground. On a bright sunny day or during the foliage, you couldn't find a better spot to investigate. If you need a workout or want to hike the Appalachian Trail a bit, head into the woods and on up to Prospect Mt. and Rand's View. But you need to be in reasonably good shape because to get to both places you have to hike up and down some good sized hills along the way. Directions: Get on Route 7 and head towards Falls Village (northwestern region of Connecticut). 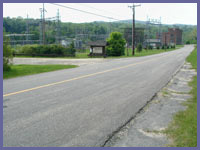 At the intersection of Route 7 and Route 126 in Falls Village, go west on Rt. 126 following the signs for Falls Village. A short distance later you'll come upon the center of town. An old railroad car diner will be easily seen. Just to the right of the diner take the small road (Water St.) as it dips down under the railroad bridge. A few hundred yards later the hydro-electric power station will be clearly visible on your left. A nice parking area greets you with a decent information board. This is also where you need to park for the wheel-chair friendly trail loop. To get to the waterfall you will need to walk go past the power station and over the old iron bridge (THE BRIDGE IS CLOSED TO CARS NOW - you can only walk it).